Preheat the oven to 400 degrees. Bring a medium pot of salted water to a boil. Add the farro and cook until just tender, about 25 minutes. Drain, return to pot and set aside. Meanwhile, combine the artichoke hearts, basil, almonds, whole garlic clove, 1 cup of flat-leaf parsley and 1 tablespoon of the Parmesan in a blender. Pulse, drizzling in the 1/4 cup of oil and 2 tablespoons of the water. Blend until smooth. Season with salt and black pepper to taste; set pesto aside. Drizzle 1 tablespoon of the oil over the squash and add 1/4 teaspoon each of the salt and black pepper. Place on a foil-lined baking sheet and roast 20 to 25 minutes, until tender. Heat the remaining oil in a medium skillet over medium-high heat. Add the onions and minced garlic; cook 3 to 5 minutes. Add the kale and the remaining water. Saute until kale is wilted, about 2 minutes. Add the roasted squash and farro to skillet. Top with the remaining Parmesan and the chopped parsley and balsamic vinegar. Add the remaining salt and black pepper; toss and cook 1 to 2 minutes, until heated through. Heat a grill pan over medium-high heat; cook steaks 4 to 5 minutes a side for medium, then remove from heat and let rest 5 minutes. Slice steaks across the grain into 1/2-inch strips and divide among four plates. Top each with 2 teaspoons pesto and serve with farro salad. 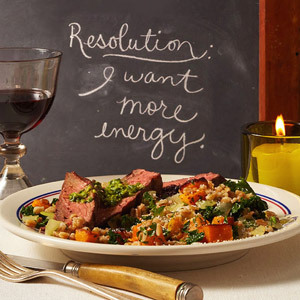 Why This Recipe Works for More Energy: Red meat contains alpha-lipoic acid, an antioxidant that helps convert sugar into energy that fuels your muscles. Farro is packed with protein, which helps rev you up. Iron-rich foods like kale and beef give you a power boost. PER SERVING: 480 cal., 20 g total fat (6 g sat. fat), 41 g carb. (6 g fiber), 33 g pro.